In some cases, depending on population size, the county must establish a regional planning coalition that then develops and administers a comprehensive regional land use policy plan. 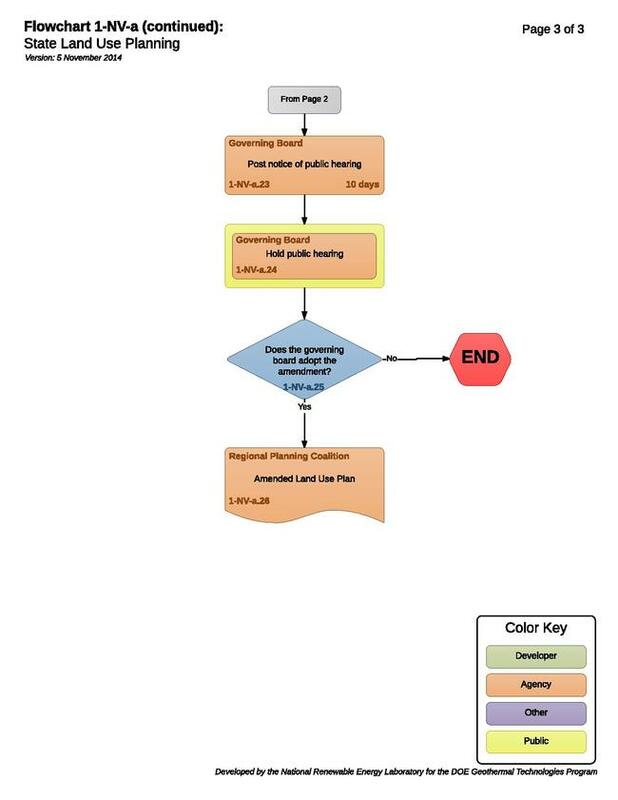 If the applicable land use plan does not allow for or contemplate the desired type of renewable energy project, the developer may take steps outlined in this flowchart to amend the land use plan. For projects that qualify as a “project of regional significance,” the master plan amendment must be consistent with the regional plan and is subject to review by the regional planning commission/coalition. Providing assistance in resolving inconsistencies between the land use plans of local governmental entities when requested to do so by one of the entities. The Nevada Tahoe Regional Planning Agency. Nevada requires the establishment of a regional planning coalition in counties whose population is 700,000 or more. For example, see the Southern Nevada Regional Planning Coalition (SNRPC). The SNRPC prepares a report every two years that summarizes adopted land use policies and submits the report to the Nevada Division of State Lands, among others. NRS 278.02584(4). Nevada also requires the establishment of regional planning commissions in counties whose population is between 100,000 and 700,000. NRS 278.0261. Counties whose population is less than 100,000 may voluntarily choose to establish regional planning commissions. 1-NV-a.1 to 1-NV-a.2 – Does the Applicable Land Use Plan Allow for the Desired Development? Depending on the project location, land use plans in Nevada are administered by a city/county planning commission, regional planning commission, or regional planning coalition. Regardless of the administering entity, the applicable land use plan may already contemplate and allow for the desired type of development. In such cases, the land use plan does not need to be amended and the developer may continue with the project. 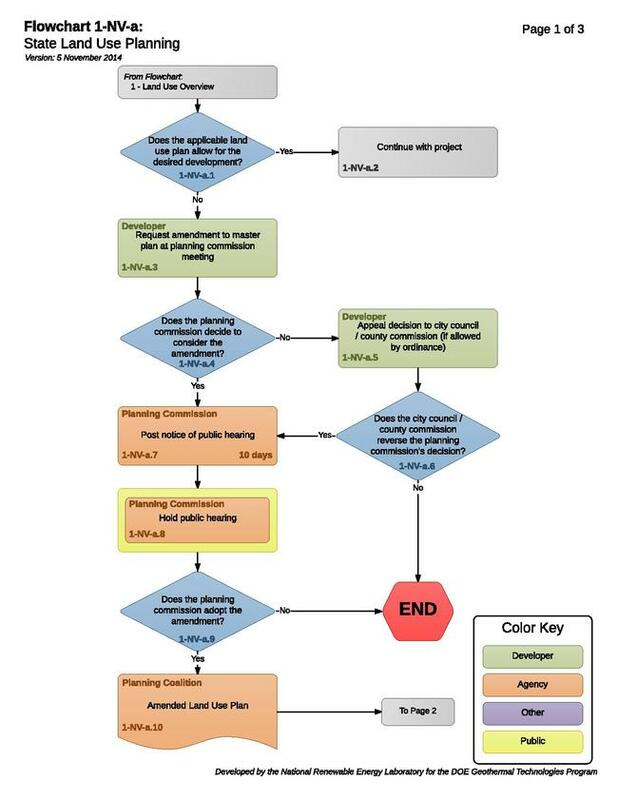 Where the land use plan does not contemplate and/or allow for the desired type of project, the developer must continue with the process outlined in this flowchart in order to amend the land use plan. County planning commissions are required to meet once a month. NRS 278.050. Developers may request an amendment to the land use plan at the monthly meeting. The planning commission will determine whether or not to consider the amendment at a subsequent meeting. The land use plan cannot be amended unless the planning commission agrees to consider the amendment. NRS 278.3195(1) allows for planning commissions to establish, by ordinance, rules and procedures for developers to appeal a decision of the planning commission. The applicable ordinance will set forth a time period within which the developer is able to appeal, and a time period within which the governing body (city council / county commission) will render a final decision on the appeal. NRS 278.3195(2). If there is no applicable ordinance or the governing body denies the appeal, the process ends. If there is an applicable ordinance and the governing body reverses the planning commission’s decision, the planning commission must subsequently consider the proposed amendment. 1-NV-a.9 to 1-NV-a.10 – Does the Planning Commission Adopt the Amendment? Either at the conclusion of the public hearing or during a subsequent monthly planning commission meeting, the planning commission will decide whether to adopt the proposed amendment to the land use plan. Land use plans may only be adopted by resolution of the planning commission carried by the affirmative votes of two-thirds (or more) of sitting members of the planning commission. NRS 278.210(3). If adopted, the amended land use plan will allow for the type of desired project and the developer may continue with the process. If a land use plan amendment approved by a city/county planning commission allows for a “project of regional significance,” the planning commission must forward the land use plan amendment to the regional planning coalition/commission (whichever is applicable) for review. 278.0277. Regional Planning Coalitions are directed by statute to establish a definition for the term “project of regional significance.” NRS 278.02542(2). A facility that generates electricity greater than 5 megawatts. Traffic by not less than an average of 6,250 trips daily. 1-NV-a.13 to 1-NV-a.14 – Is the Project within a County with a Population Greater than 700,000? Pursuant to NRS 278.02514 counties in Nevada with a population greater than 700,000 are required to establish a regional planning coalition. If the project qualifies as a “project of regional significance,” developers may request to amend the comprehensive regional policy plan in order to include the type of desired development. The regional policy plan balances the economic, social, physical, environmental and fiscal development for growth in the region over a twenty year period. NRS 278.02528. 1-NV-a.15 to 1-NV-a.16 – Does the regional Planning Coalition Adopt the Amendment? A regional planning coalition can only adopt a proposed amendment to the comprehensive regional policy plan by resolution supported by the affirmative votes of two-thirds (or more) of its total membership and ratification by the board of county commissioners of the county and city council of each city that jointly established the regional planning coalition. NRS 278.02528(3). 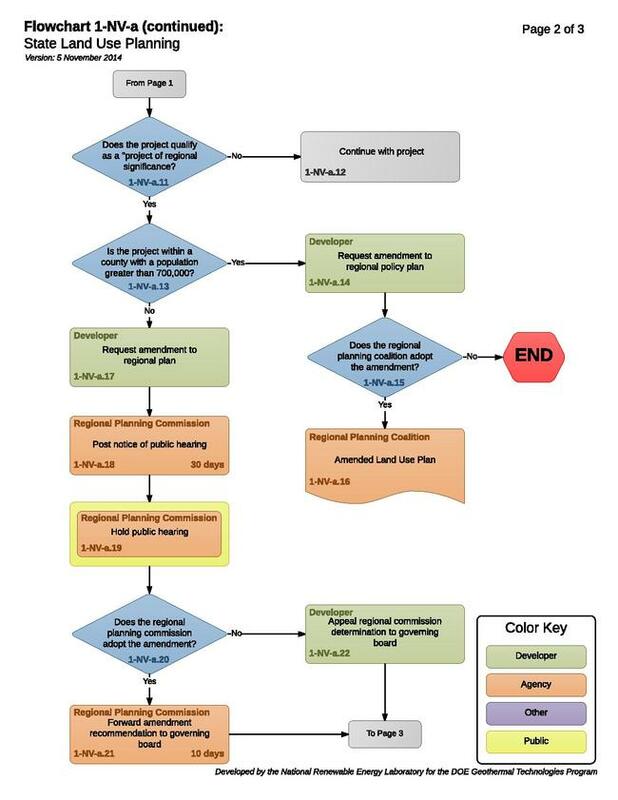 Given the additional requirement for ratification, there may be additional processes (public notices, hearing, etc) carried out at the county level prior to ratification. Currently, there is only one county (Clark) in Nevada that has an established regional planning coalition, the Southern Nevada Regional Planning Coalition (SNRPC). If, at the annual meeting, the regional planning commission decides to consider a proposed amendment to the regional plan, they will hold a subsequent hearing on the amendment and post public notice of the hearing at least 30 days in advance. NRS 278.0272(9). 1-NV-a.20 to 1-NV-a.22 – Does the Regional Planning Commission Adopt the Amendment? After receiving an amendment recommendation from the regional commission or the appeal of an amendment denial from the developer, the governing board will hold a public hearing on the recommendation or appeal and post public notice of the hearing at least 10 days in advance. NRS 278.0276. 1-NV-a.25 to 1-NV-a.26 – Does the Governing Board Adopt the Amendment? A decision by the governing board to adopt the amendment must be by resolution, supported by the affirmative votes of a simple majority of the board. NRS 278.0276. If the amendment is adopted, the land use plan will be changed accordingly by the governing board.